I’m working on being bold – whether it’s in a one on one conversation or in a presentation. In the past, I’ve often watered down what I say to avoid upsetting anyone. And I’m not alone. Many of the people that I coach are concerned about being bold. As a result, they dilute their message so much that they have zero impact on their audience. Being bold is not something that you can “pull out of a hat” when you’re giving a presentation or speech. You need to develop an attitude of speaking out in your day to day life. Otherwise you won’t develop the courage to be bold in your presentations. Practice saying what’s on your mind when you’re with just one other person or a small group. I’ve found blogging to be extremely useful in helping me be bold. Some posts I’ve written have taken me some time to publish because of my fear, but having done so I’m bolder. Here are some thoughts to help you develop an attitude of boldness in everyday life. Do you hold back saying what you think because you want to make sure that everything you say makes perfect sense and is supported by evidence? Me too. But research shows that people who speak up more are seen as leaders. Now that makes sense, but here’s the topsy-turvy kicker – what they said didn’t have to be particularly brilliant or clever or original. So don’t worry about being perfect, just speak up. Sometimes when I want to say something bold, I stay silent because I just imagine a nameless disaster. But if I think it through and ask myself “What’s the worst thing that could happen?” then I realise that the worst that will happen is that the person I’m speaking to might be upset for a day. Can I handle that? Yes, I can! And then often they don’t even get upset for five minutes. They just thank me for being straight! Often the consequences that we fear from being bold don’t materialise. Then use your presentation to persuade people to take that action. Imagine what you would dare to say if you knew that the audience were the friendliest most supportive bunch of people. That they’re already on your side. Now say that. If you’ve been reading my blog for a while, you know that I call this your Key Message. The work of crafting your point into a Key Message has you think through what you really want to say. If you allow yourself several sentences to express your point, you’re likely to have woven all sorts of qualifications and caveats. So don’t. Say it in one clear and succinct sentence. Do you pepper your phrases with weasel words and phrases? Like “I’d just like to” or “sort of” or “kind of”. They reduce the power and boldness of your ideas. You may not know you’re doing this. So either record yourself and listen back, or ask a friend to give you feedback. Stop holding back – be bold. You’ll get your message across, spread your ideas and enhance your career. Being BOLD takes us out of our comfort zone. When we step out of our comfort zone we make it larger. For the novice, just speaking in front of a group is BOLD, and a start! Wow. BOLD! I have tried to being bold in some of my speeches, by using your tips like ‘asking audience to take action’, and ‘ask provocative question’. And i must say it really feels good after I did it. As always, great stuff! This post also reminds me of a rather humorous find: http://twitpic.com/4xha23 Enjoy! That’s a great find! Having spent the first 20 years of my life in England I can totally relate! As you might suspect, I possess a naturally bold personality! Those words are like catnip to me. Say them, and it’s 10 times more likely that I’m not going to comply! Go ahead and be bold. Sure, you’ll get in trouble for it. And many people won’t like you. But you’ll treasure those who do! Ha – yes I think I would have guessed that about you! For those of us who are more cautious your point about treasuring those who do like you is great. It’s been my experience that audiences like speakers that have opinions and take a stand. They may not agree with the speaker. They may not like what the speaker said. However they appreciate the authenticity and frankness. I am one that likes to challenge people’s point of view, especially entrenched traditional, that’s-the-way we’ve always done it perspectives. I find that being bold doesn’t mean you have to be rude. You can still be assertive, bold and provocative without doing harm to another. Pithy and poignant, Olivia. Well done! Love the quote, John, thanks for adding it. Great quote, John. I’m going to make this part of my vision for 2012! 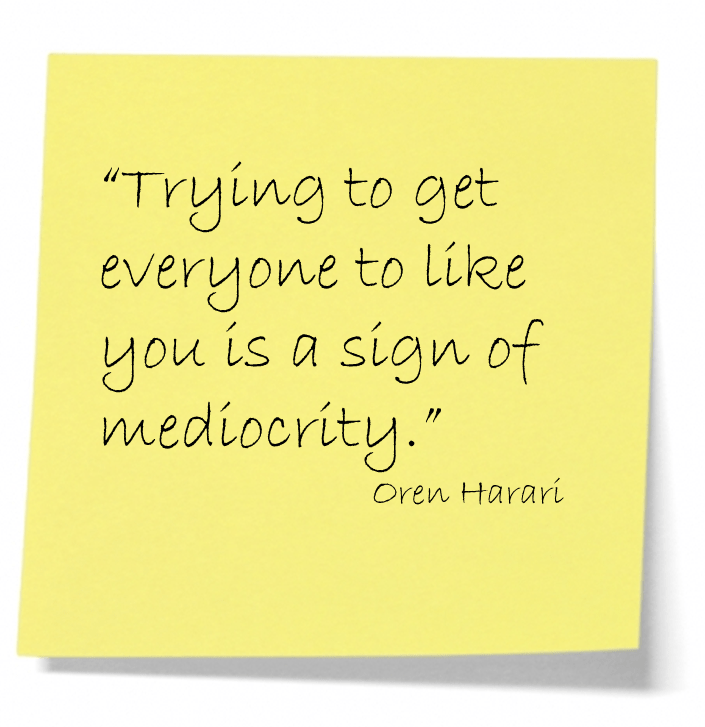 Great post, one of our writers actually used lesson number 1, “Trying to get everyone to like you is a sign of mediocrity” in a related post targeted at brands and how they should act bold and not please everyone. Yes, the principle is the same – whether you’re a brand or a person. Excellent article with a wonderfully useful list of specific tips. I especially like #3 and 4 – not saying anything and your ideas help other people. We hear all too many speakers who drone on without getting to the point, but never taking a stand. In my workshops, I see this more with women, particularly as they secure their ideas with “I heard, they said…” Women are less likely to own their ideas. We should all remember that what we share can be anywhere on the spectrum from “a good reminder” to “life changing.” Personal stories, experiences and opinions make a presentation relevant and real. Great tip. Thanks for a great article! Thanks Marla, I’m glad you found the article useful. I find that even removing the words “I think…” or “I believe…” makes a stronger impression. Thanks for the article. This is extremely useful. But speaking is an art too. Just like speaking boldly can’t be pulled out of a hat so is speaking thoughtfully. Some people are so bold and dogmatic that they tend to sound offensive and destructive to other people’s confidence or self esteem either intentionally or unintentionally and they don’t even bother to care as to how many people they have disrespected in the process. But I think one should also give a thought before speaking because once we let words go out of our mouth we can’t take them back. Those who speak their ideas aloud might be seen as leaders but in course of time every smart person realizes if he/she is worth it or if the leader is just trying to show that he/she is the boss. It depends on each one’s way of thinking and what they value. At least I believe that speaking both thoughtfully and boldly is a more tougher and valued skill than just speaking bold. Thank you for adding your wisdom. I do agree that you can overdo being bold – as you can overdo any public speaking advice. There is always a balance. I wrote this post for people who tend towards being thoughtful and possibly cautious, to encourage them to be bold. The combination of being both thoughtful and bold as you suggest is a winner. Inspiring! olivia.i have read your write ups and i find it quite inspiring.And i pray that i do well in that field.thanks alot. This is Naresh from bangloore. I read you post and hope it will be helpfull for me .Let me try the following points from now and mail the feedback. Note:This is my first time of commenting in web post like this. Thank you for commenting and I wish you all the best in your presentations. thank you for the useful post. It made me think about Robin William’s books on design. She teaches that contrast is very important. It makes stuff interesting and beautiful. Being bold is a way to give contrast to your message (N.B. not conflict). Maybe, being bold, makes the message intresting and beautiful. I love the points that you made, especially about fear of people not liking you. You should always be true to yourself and your beliefs in every aspect of being. Just because someone does not agree with you does not mean you have done anything wrong. Everyone is entitled to their own opinion. Whether your opinion is similar to theirs, differentiate from theirs, or changes theirs, you have completed a job well-done. As long as you get the audience thinking you have full-filled your role. As an audience member of many speeches I notice that often times the speaker holds back from being bold because they actually fear how we will be affected by their views, and they fear negatively affecting the audience. Times like these I reflect on a quote from world-renowned spiritual activist Mirianne Williamson. I really enjoy’d reading your article. I myself get panic attacks easy. do you by chance have any advice for people who tend to freak out with public speaking because of prior experience. when I was a child I was traumatized when I was in a recital and it kind of stuck with me deeply. I’ve gone as far as going to karaoke places so as to expose myself to being seen. when I have to present a project for school I literally shake, I have whats called familiar tremors it doesn’t really effect my life until Im nervous it just makes it frustrating. any tips? Olivia, What a great summary. From my years of consulting, I agree with all of them. However, I think the BOLD statement was bringing these together with a motivating call to action. I’ll quote you often on this. Thank you. I am currently on a purposeful soul searching journey to permanantly liberate my voice. I relinquished my personal power as a child and couldn’t figure out why I was experiencing being trapped within myself. I just kept saying for all of these many years that “there is something wrong with me” Consequently, last night through much prayer, tears and agony I discovered that I never responded to insult, mocking, accussation, ridicule or punishment from those around me…I just took it and kept quiet ALL THESE YEARS! With that being said, I find this article so on target, educational and soothing. The responses and speech that you describe accurately display what I have been saying, thinking and doing. Thank you for blessing me with this valuable information. I’m on my way to Re-Learning to be BOLD! Thank you. FREE TO SPEAK RESPONSIBLY BOLD! Within no seconds , your words reflected my fear attitude in me, but it took minutes to express what i am trying to do it now. However i am very much grateful to you, that at last I started to express and I will not stop it here. I always talk to myself but never spill it out. Thanks for your words which have pushed me ahead, a bit, from where I used to stop always. we don’t lose shy characters overnight. It takes years of practice to speak freely for some people, like myself. I’m still learning. Don’t give up. The secret is keep trying and you will attract what you want. hello… i am student of 1st year. i dont have boldness. i am soooo unbold. u cant belive how much unbold i m…. please tell me basic tips how to be bold…. Wonderful writeup sire, being bold is what all great people have in common, they always seems to know exactly what to do. This is good read. There is a another nice article that delves into the science behind stage fright. Once you understand the cause its easier to follow the solution – http://www.delhiplanet.com/index.php/2014/02/22/overcome-stage-fright-public-speaking-tips/. Thanks a lot for this important article as i was searching for this similar kind of information and found out your article which i think is great help for people like us who always has been on low confidence and has fear of interviews so thanks a lot for this article. Kudos to this article.Going to bookmark this for sure. Really It is very difficult to me. Because of my shy nature. I have very good knowledge but I can’t explain properly in the meeting that’s the main reason to reading this content. I am very impressed this content and i am also impressed one youtube that is #Hicounselor everyone should watch once this channel it explains in a very nice way.